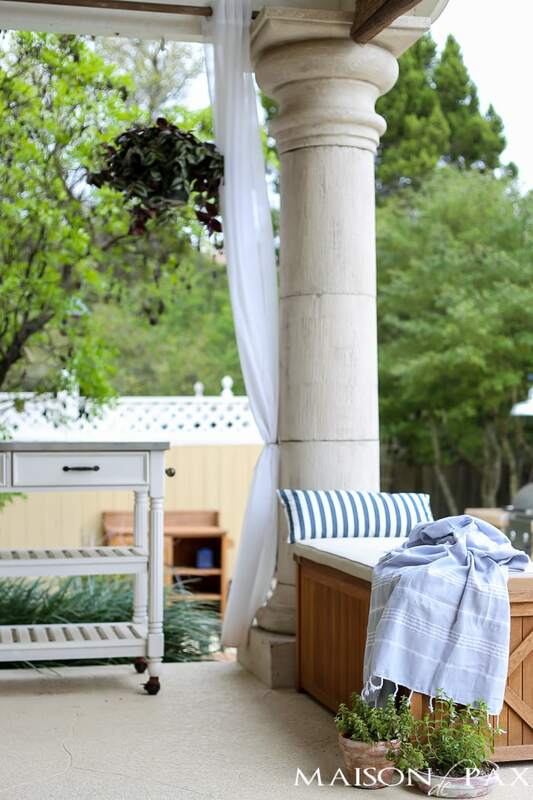 There is nothing quite as wonderful as soaking up the spring sunshine on a beautiful patio. 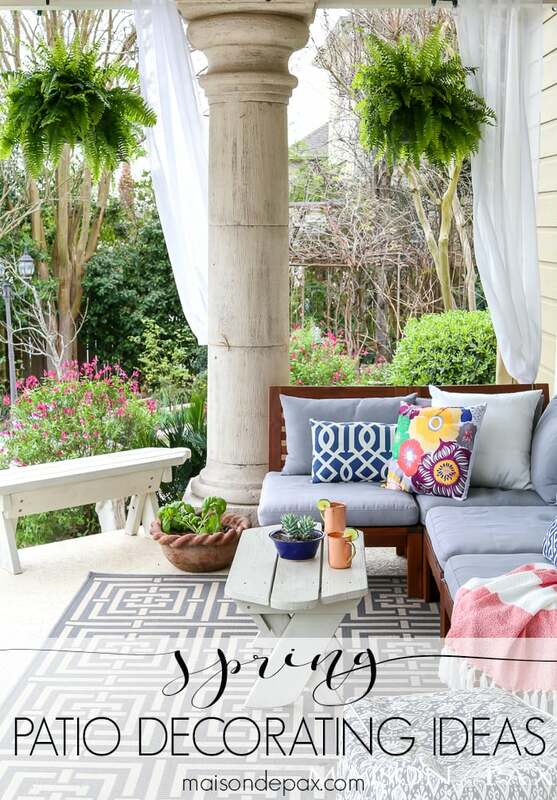 Don’t miss these spring patio decorating ideas! 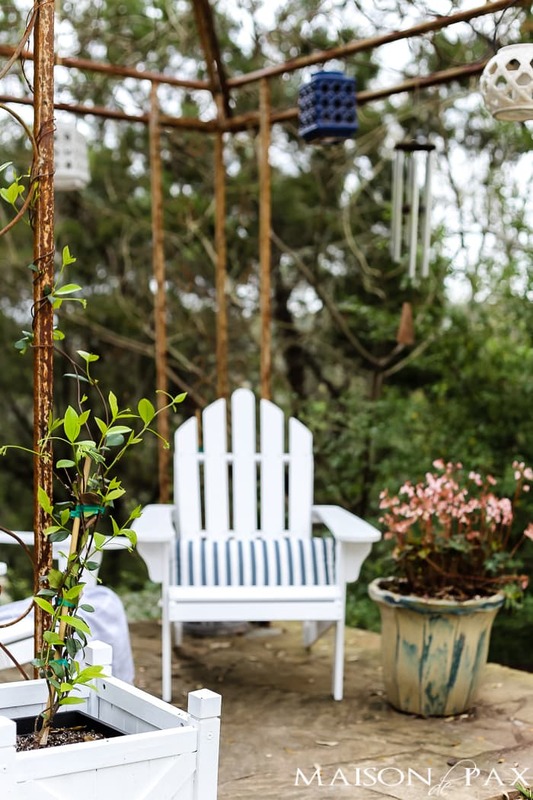 This week on the blog might as well be titled “Spring Extravaganza”… And I can’t think of a better way to kick it off than with some gorgeous outdoor central Texas spaces as part of the Joyful Spring Home Tour, which has been generously sponsored by hayneedle. Plus, be sure to go all the way to the bottom for your chance to enter to win a hayneedle gift card! 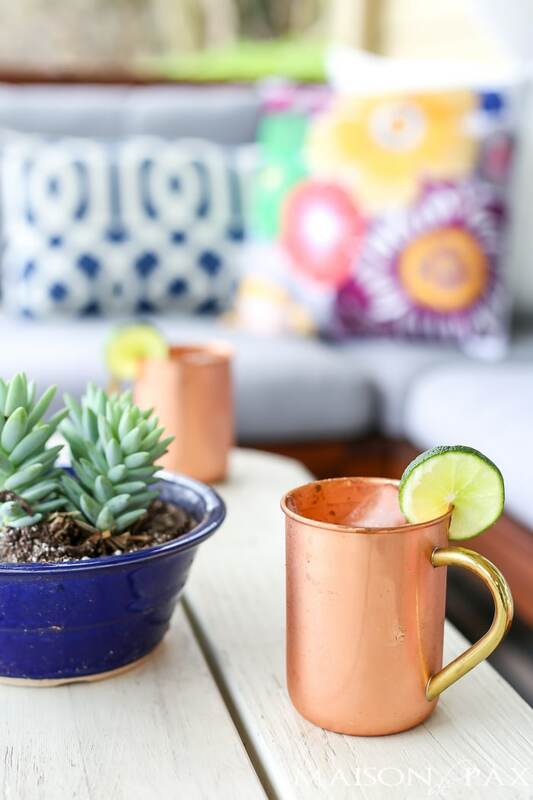 I know many of you are still battling snowy yards and icy roads, but here in central Texas, we have to take advantage of the 60-80° weather while we can… Summer proves a bit rough at 100°+. 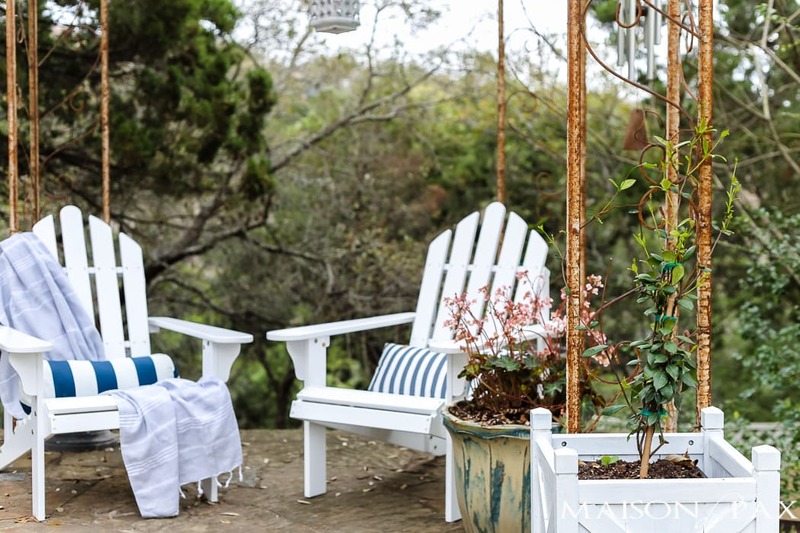 😉 So I spent the last couple of weeks sprucing up my outdoor spaces to share with you today! 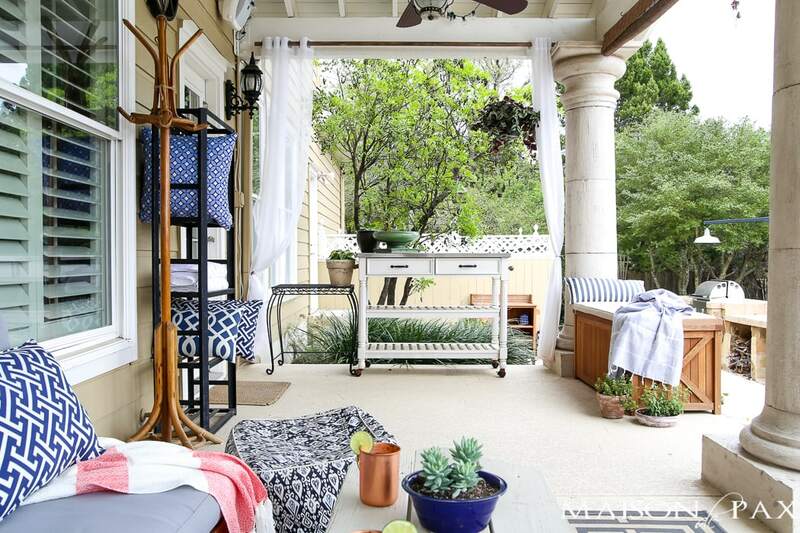 Our back porch got a pretty serious makeover last summer, and we have loved using it since. This year, though, I wanted to compliment some of the natural colors in our landscaping, so I brought in a little touch of pink. It started with this beautiful embroidered pillow from hayneedle and a throw I found locally on clearance to highlight the coral. And these amazing Boston ferns. 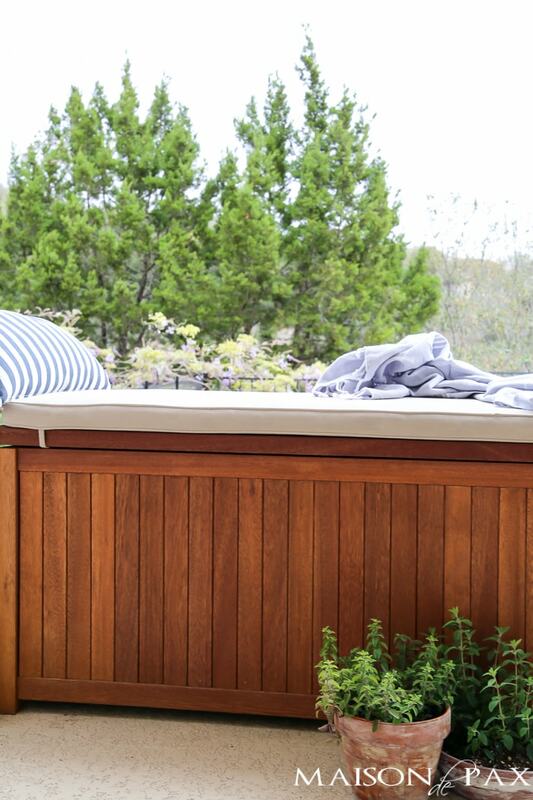 A few potted herbs finish off the lush, outdoor feel. We were previously using some old plastic chairs left by the last homeowners, and I decided a little more polished look would be nice. 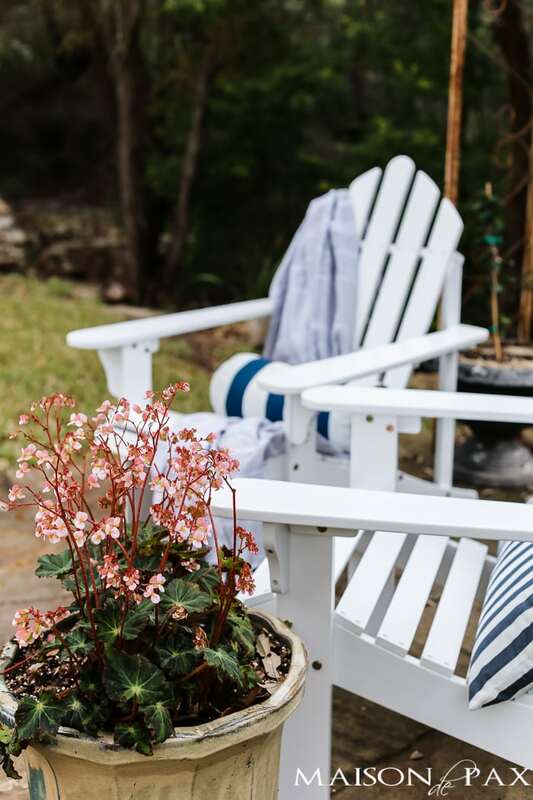 I painted these planters white last fall, and I love the crisp look… So when I found these adirondack chairs from hayneedle, I was sold. 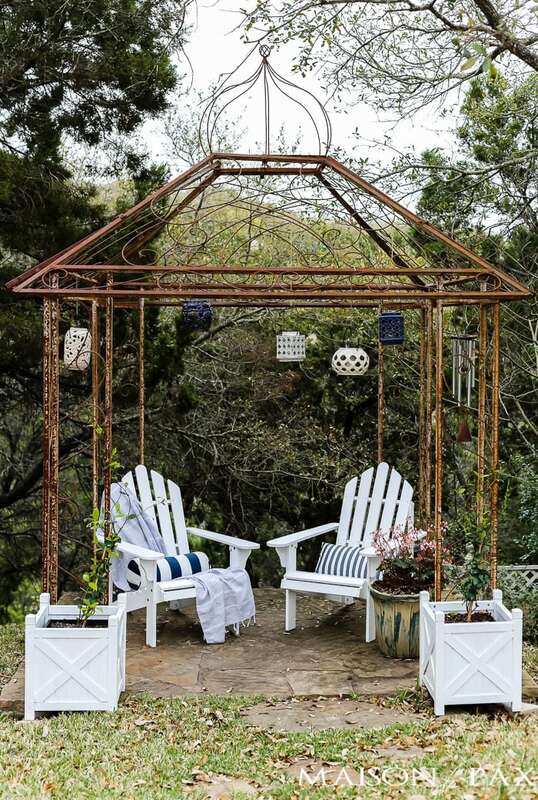 I love how they all go together and create a simple, classic look under the rustic arbor. The jasmine and begonias (both excellent for shade) were more finds from my local nursery, and I can’t wait to see how it looks when the jasmine takes over. 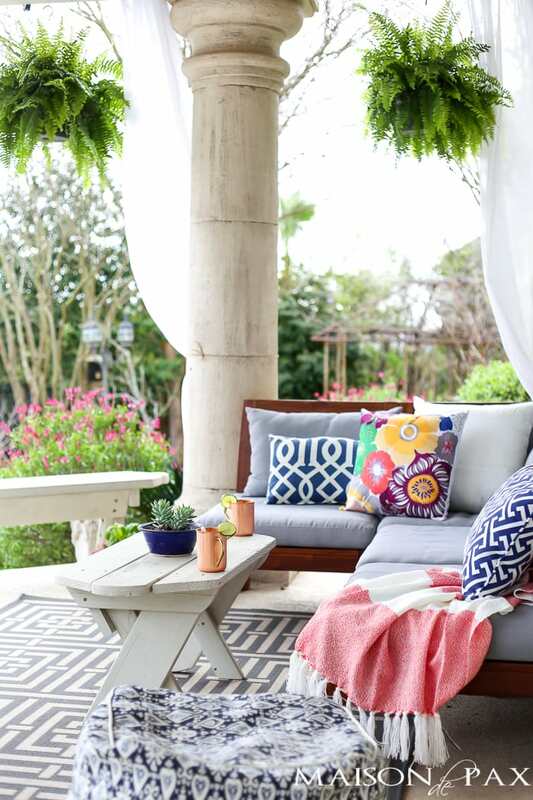 A couple of outdoor throw pillows I already had and this fun turkish towel make it cozy for the breezy evenings. If you’d like to see more, you can see our spring dining room here, and I’d love for you to come back throughout the week as I’ll be sharing much more of our home as well as a free spring printable! 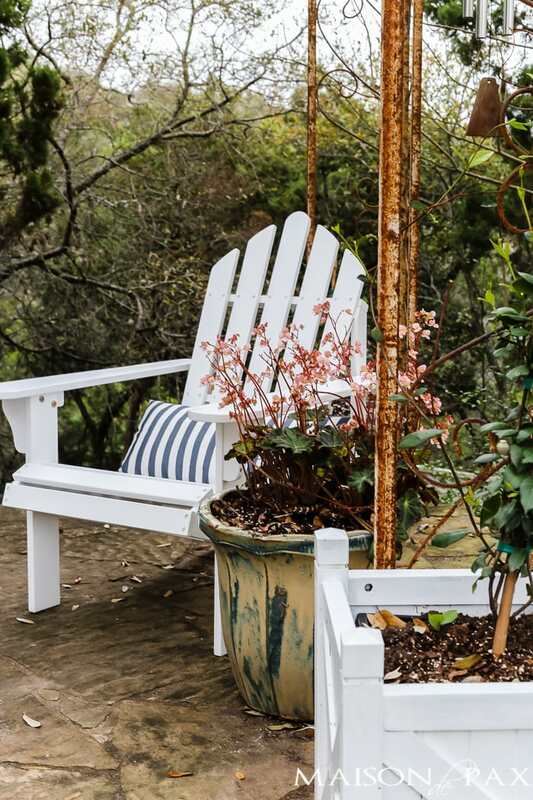 Disclosure: Thank you to hayneedle for providing some fun new pieces for my patios! Now here is your chance to enter to win $250 to hayneedle. 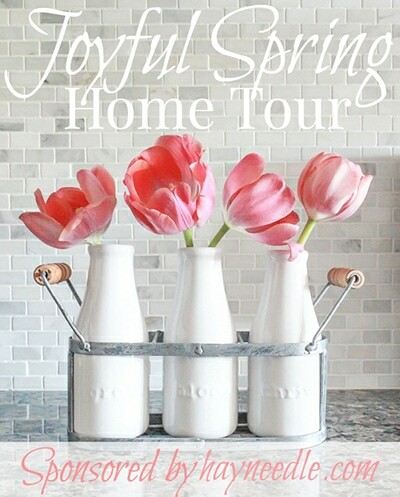 Be sure to visit the other lovely ladies below who are sharing this week as part of the Joyful Spring Home Tour! Your patio looks amazing!! The pictures make me want to go buy some plants and flowers ASAP. Love the new chairs from hayneedl.com. I can definitely see them being put to good use this Spring and Summer. I’ve thoroughly enjoyed being a part of this tour with you! You are a dream to work with! Rachel everything is so fresh and pretty for Spring! Can’t wait for the rest of the week for even more inspiration! You’re so talented. You are too sweet, Laura. Thank you! Rachel, your patio looks amazing! I love all of the pretty colors and your new Hayneedle chairs! 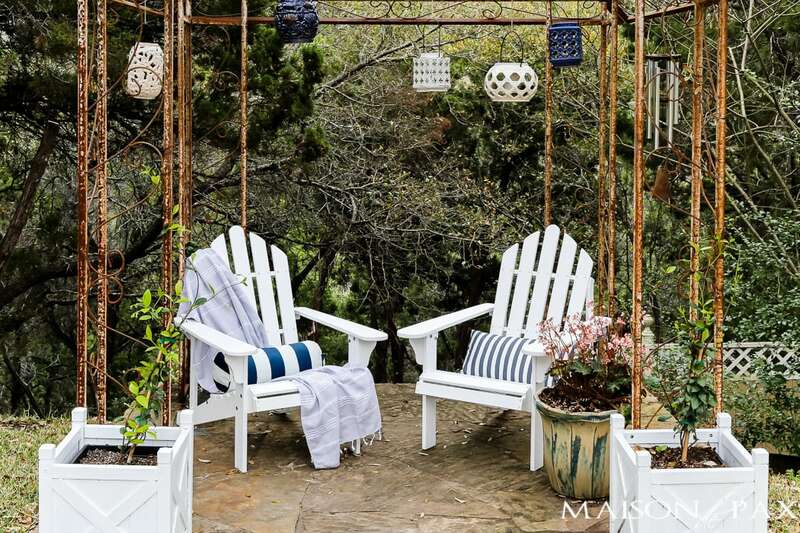 This looks like the perfect spot to enjoy a lovely Spring Day. Thank you so much, sweet Stephanie! It all looks wonderful Rachel! Thanks for the beautiful ideas!! 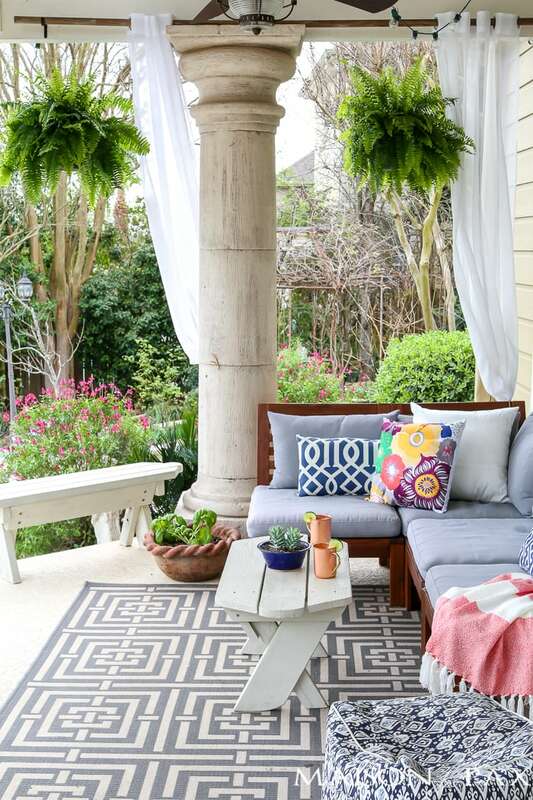 Your outdoor spaces are just gorgeous. Hope that you are finding some time to enjoy them. You are so sweet, Laura. Thank you! So beautiful, Rachel! 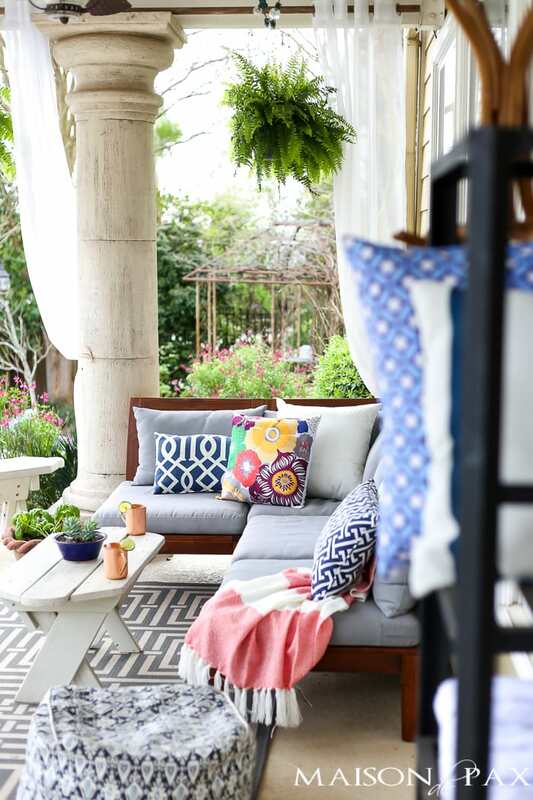 The pillows are fabulous and those ferns look amazing! What a wonderful space to enjoy! 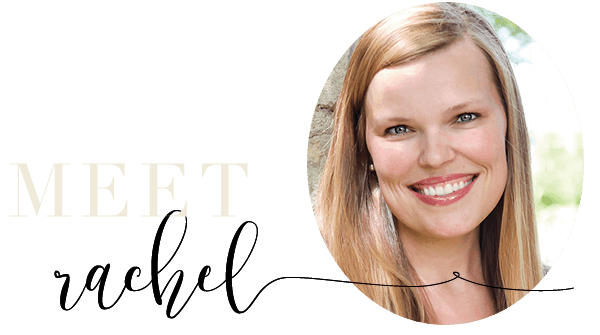 Thank you, Rachel! So fun to tour with you this week! Rachel this is amazing! I want to come hang out on your outdoor space all summer. So incredible! Rachel, i really enjoyed your patio and your secluded little oasis. Gorgeous! Still waiting on spring here. Enjoy yours before the Texas heat arrives. I love the combination. It’s half classic half modern.